-High pressure 1.4 bar (20psi), stainless high temp cap. The standard cap with our radiator will allow your system to operate at 25% higher system pressure. That raises the boiling point even further. The seal is high temp silicone, not rubber that will crack and leak. -B tube core. The B tube is actually two tubes in one. The B tube has a septum, or divider that runs down the center of each tube. This increases the surface area and help to equalize the wall pressures inside the tube to further optimizing cooling efficiency. Our core is one continuous tube, not two cores sandwiched like you might see in other large capacity cores. This means maximum surface area with minimal external size/weight. -High fin density. Our core is 19.5 fpi, or fins per inch. 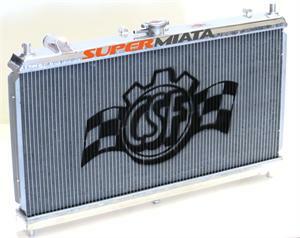 Our testing has shown that 18-21 fpi is the sweet spot given the airflow, temp deltas and water pressure of Miata system. Why replace the stock radiator? When old and ready to crack, the plastic turns a brownish color. If yours is light brown to almost yellow, it's a time bomb. We recommend replacing the OEM radiator before going to the track. Suitable for any power output from stock to the most heavily taxed 300whp turbo track Miatas running factory A/C. Pair with our Coolant Reroute kit for the maximum cooling efficiency in your Miata.